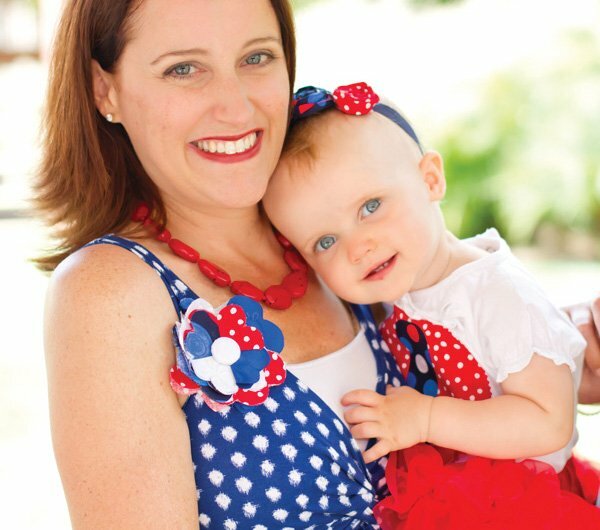 Susie had SO much to celebrate for 4th of July last year: her husband’s homecoming from the Navy, her daughter’s first birthday, a big move across the country, AND Independence Day! 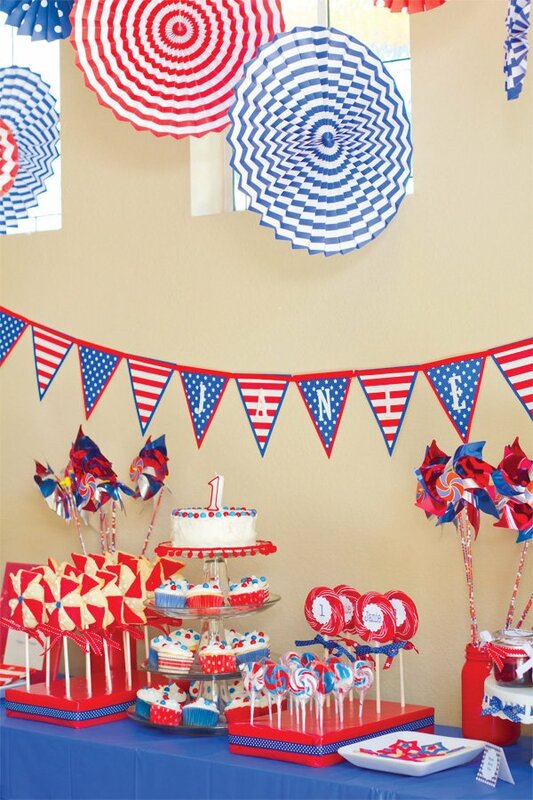 One great big celebration was the way to go, of course, so she put together a wonderful Patriotic Pinwheels Party to celebrate with all their friends & family. 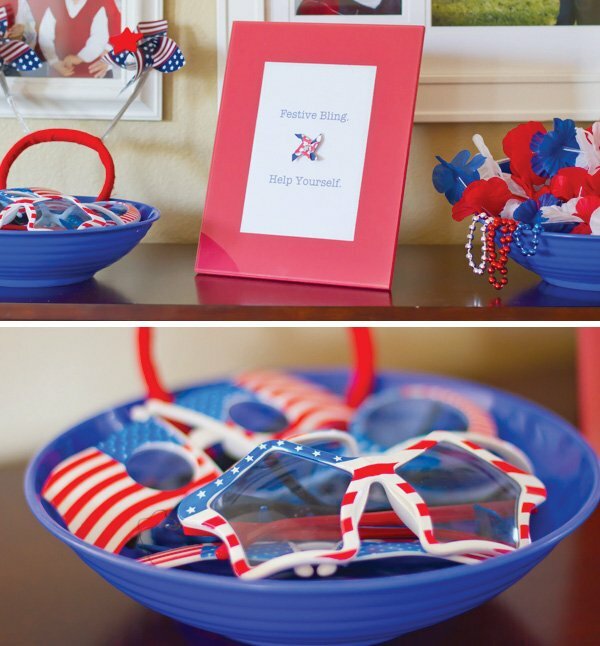 Read on for tons of great red, white, and blue party inspiration, plus a detailed recap of the event from Susie. 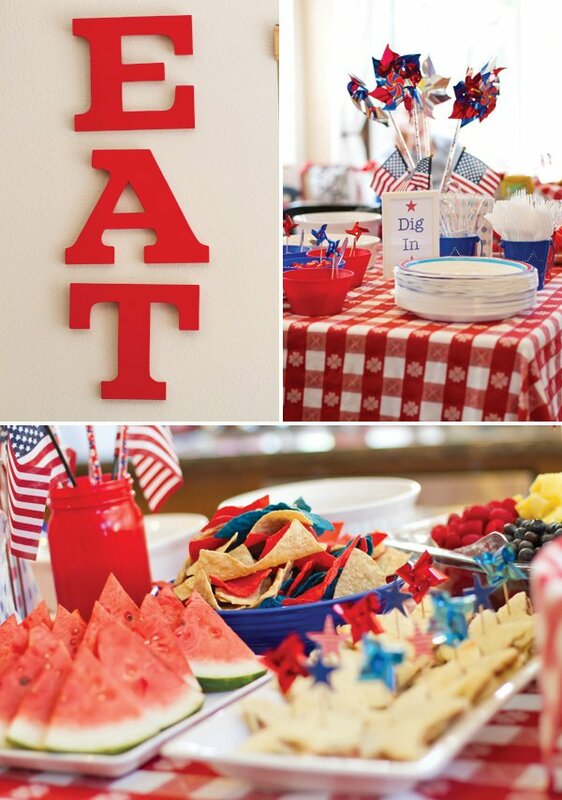 There are so many great ideas here for any 4th of July celebration! 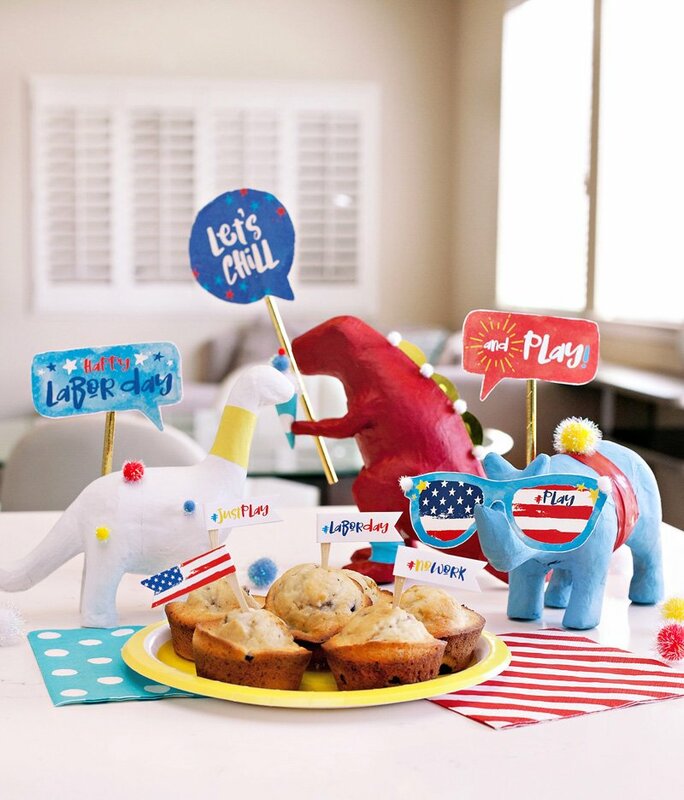 We had many reasons to celebrate on the 4th of July last year. 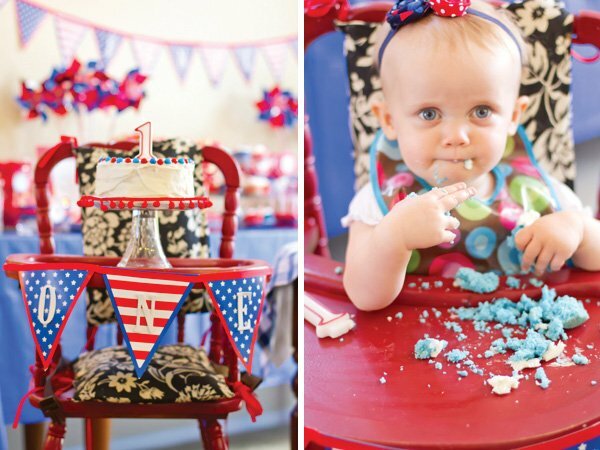 Our sweet baby Jane was turning 1, her Daddy just arrived home from a six-month deployment, we would be moving a few weeks later from San Diego, CA to Annapolis, MD, for our next adventure with the Navy, and it was Independence Day! So, we invited all of our friends and family to join us to CELEBRATE!!! 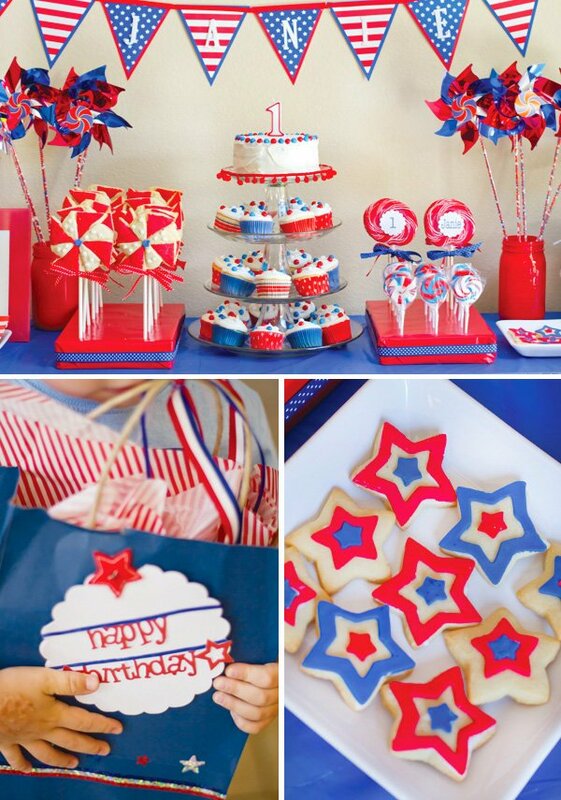 I decided patriotic pinwheels would be the theme for the party. 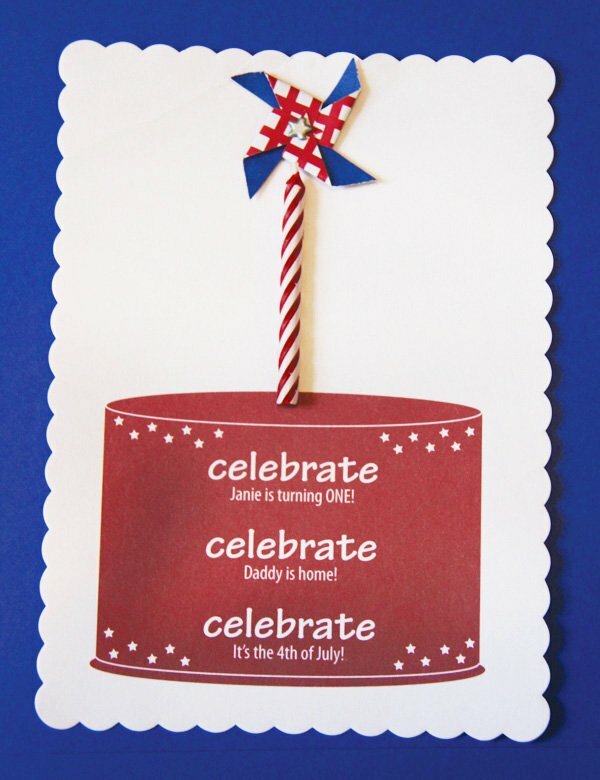 I purchased the 4th of July Pinwheels Printable Design by Anders Ruff and their sample themed party served as my inspiration. 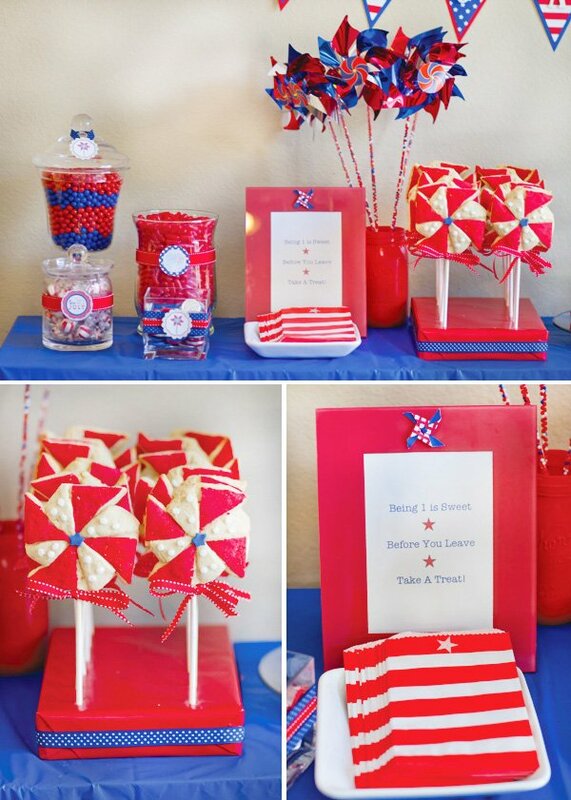 The invitations included a picture of a birthday cake with a real birthday candle glued on and a tiny handmade pinwheel on top. 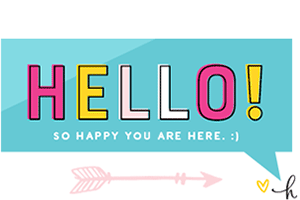 I also printed out patterned paper (from the Anders Ruff collection) to line the envelopes. 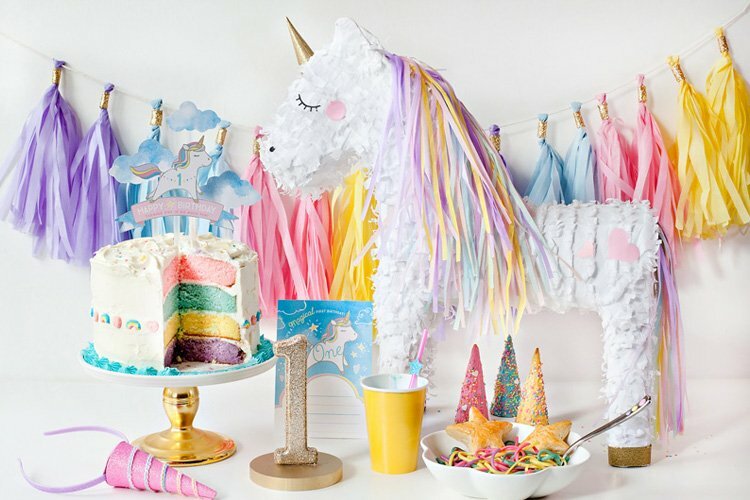 I always feel like it’s worth investing in fun invitations as they set the tone and theme for the party. 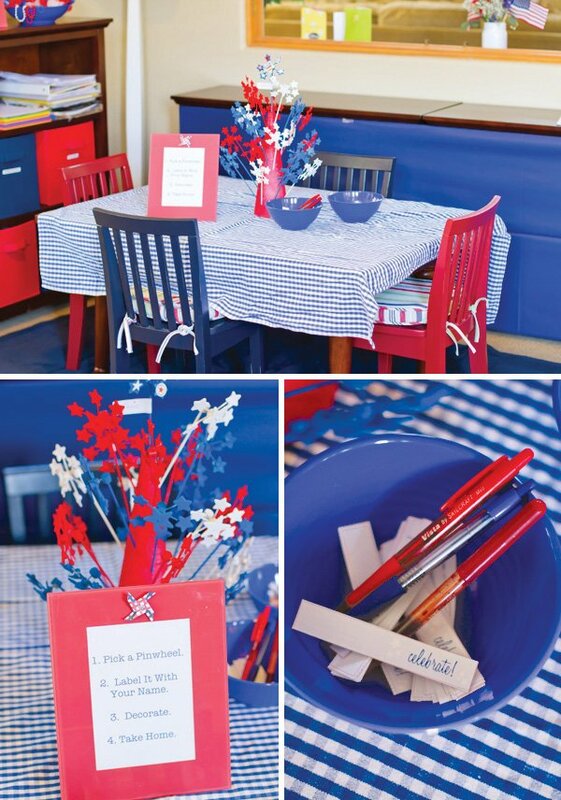 For the décor, I lined our walkway with American flags and great big pinwheels that I purchased at Big Lots. 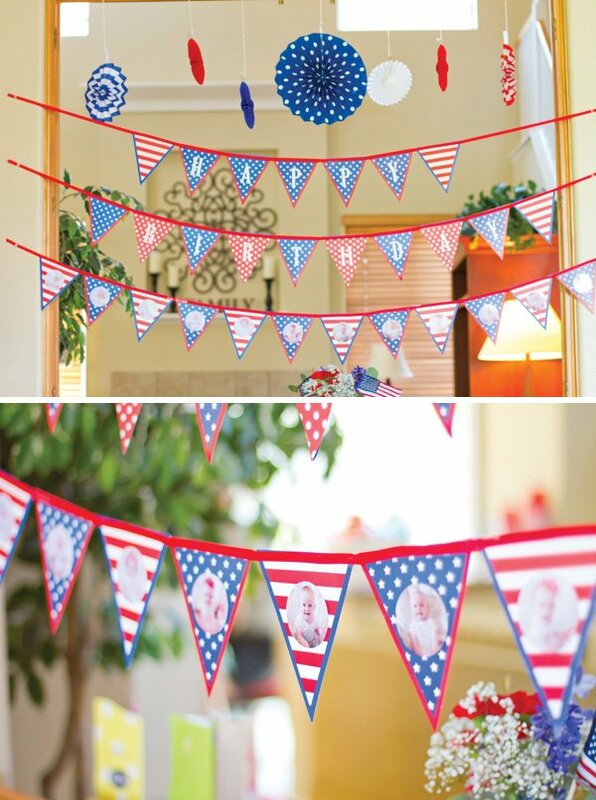 We had lots of patriotic bunting and flags around our yard. Right inside the door, I hung patriotic pennant flags that I found in the dollar bin at Target and put white letters on it that said, Happy Birthday Janie.” I also used one set of flags to display the 12 months of photos I had taken of Janie each month over the past year. 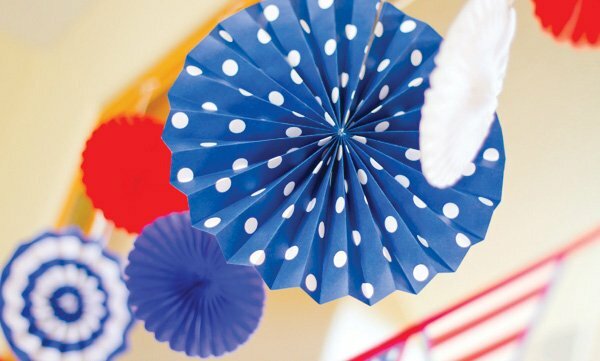 Above the flags, I hung patriotic folding fans that I purchased at Party City. Party City also had really cute red and white polka dot balloons that I had around the house. 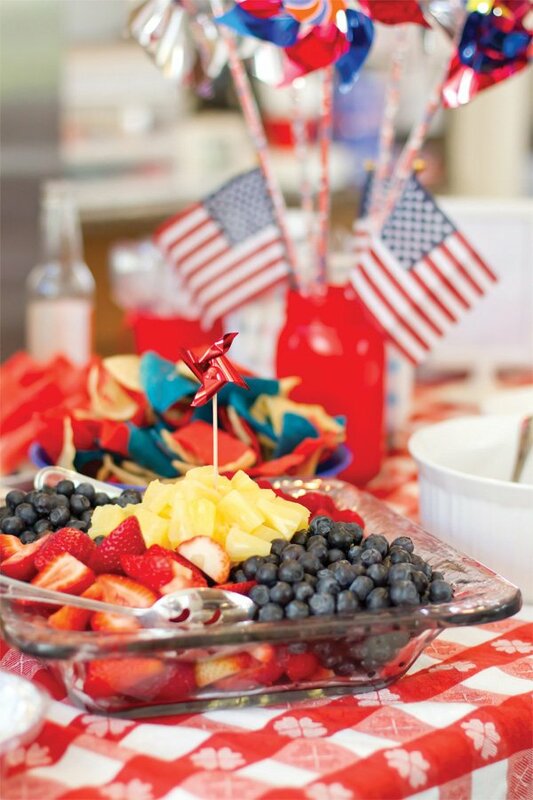 For the tables, I used red and white gingham and blue and white gingham tablecloths. 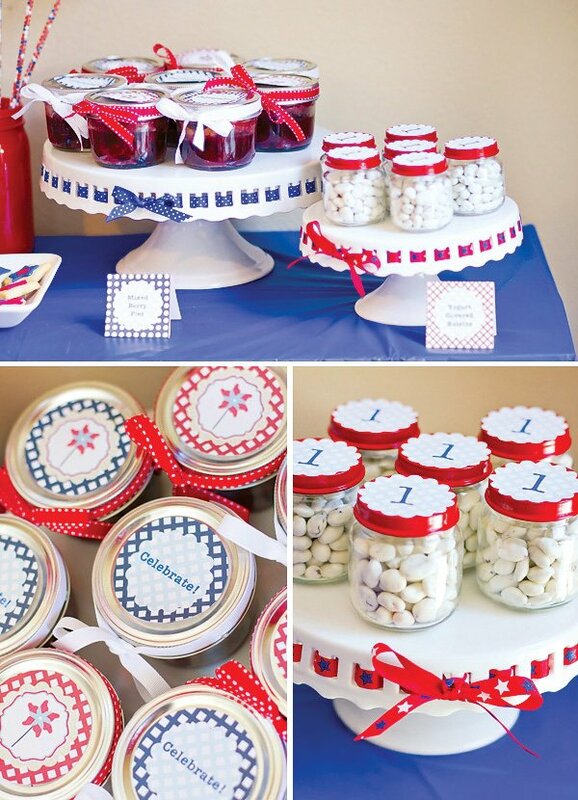 I spray painted mason jars red, white and blue after seeing a tutorial on Joys Hope blog. 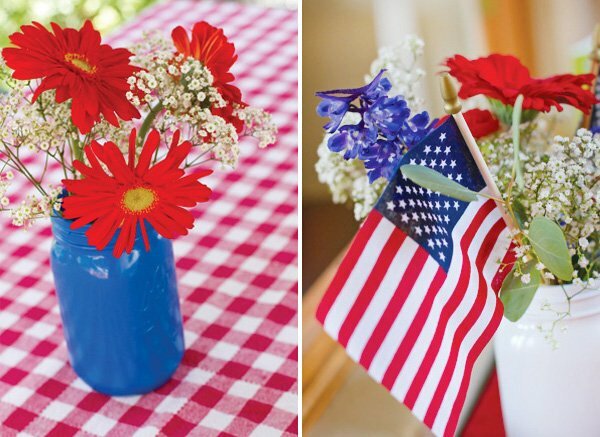 For the centerpieces, I used red gerbera daises and babies’ breath in the mason jars with some small flags. For the kids’ table, I filled the mason jars with rice and put in some pinwheels. For food, I didn’t want someone tied to the grill all day, so we had a make your own taco salad bar and served them in star shaped tortilla shells. I was able to make the chicken, beef, rice and beans ahead of time and put out fruit and chips on the day of the party. 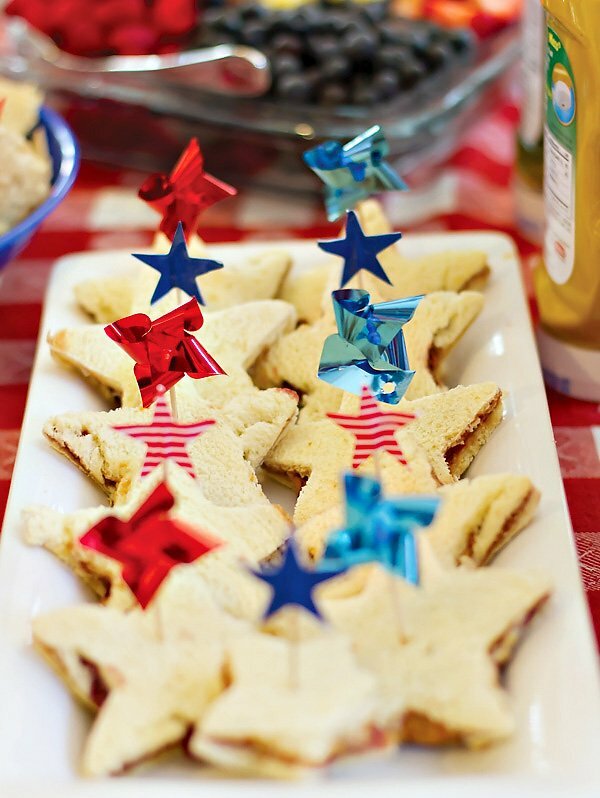 I also made star shaped pb&j sandwiches for the kids. As for drinks, I bought vintage sodas from Cost Plus World Market and both the kids and adults loved drinking Strawberry Soda from a glass bottle. 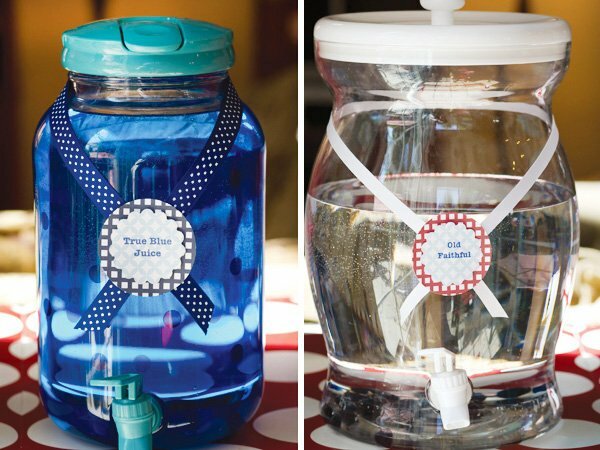 I also filled drink dispensers that I bought from Wal-Mart with Red Cool Aid (Rocket’s Red Glare), water (Old Faithful), and blue Cool Aid (True Blue Juice) and used the Anders Ruff labels on them. There were blue and white paper straws available as well. The dessert table was my labor of love. The pinwheel cookies were my absolute favorite! My friend Sunny Spencer made them as Janie’s birthday present and I stuck them in Styrofoam that I covered with red wrapping paper and ribbon. I also spray painted the lids of baby food jars and put on a circle printable from the Anders Ruff collection and filled them with yogurt-covered raisins. Another favorite were the mini-berry pies in small mason jars. The rest of the candy came from Oriental Trading Co. 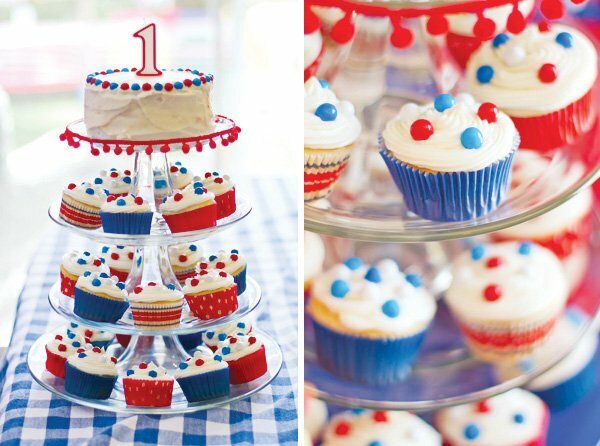 I bought red and white striped treat bags and used a star punch out on the top and put a sign next to it that said, “Being 1 is Sweet, Before You Leave, Take a Treat!” I made the cupcakes and layered Janie’s cake to be red, white and blue. My other favorite thing about the party was Janie’s cute birthday onesie and headband. My friend Jaylene Farry (Farry Creations) made these as a birthday present to Janie and they turned out ADORABLE! The day turned out perfect in every way! Everyone had a blast and it was the best birthday/welcome home/farewell to friends/4th of July party we could have asked for! I love everything about this! The decorations are great! 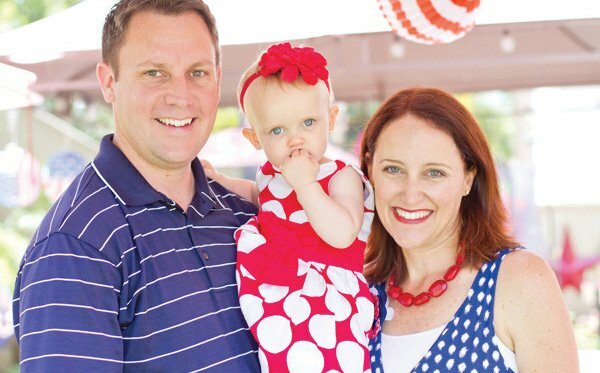 The family is adorable – and what wonderful reasons to celebrate. Thank you for serving our country! What a beautiful example of how such simple elements can be put together in completely striking ways. 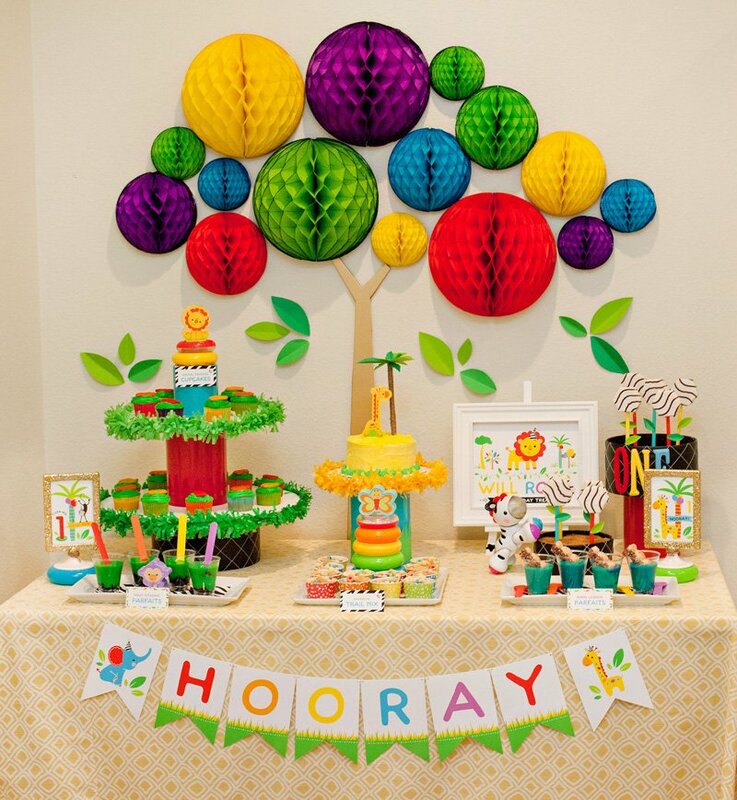 Beautiful party! What an beautiful party! 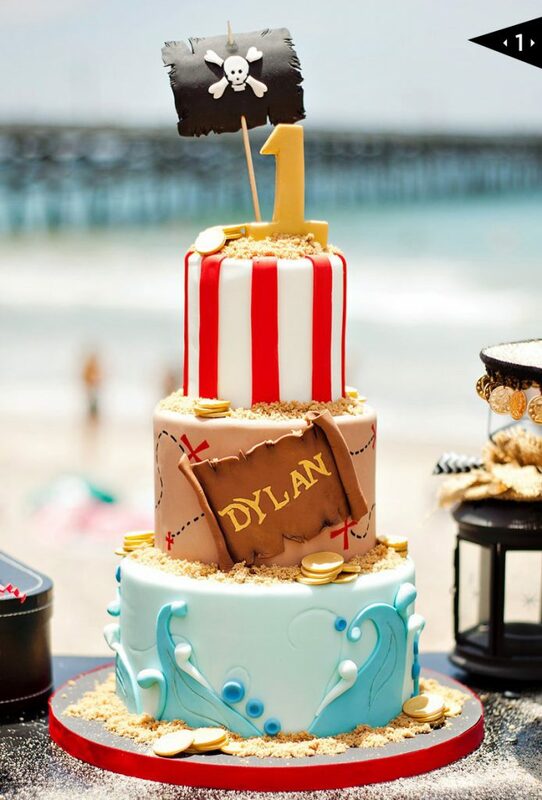 Bright, festive and the details are just too amazing! I hope she shares another one of her creative parties with everyone! Adorable! easy and affordable….love it!